Known as the Joker's girlfriend and a villian in her own right, this 16' fully articulated DC bad girl Harley Quinn is dressed in a one-piece cat-suite of red and black strectch velvet with an off-white matte satin collar trimmed with mini pom poms and shear pleated cuffs. Her hood is also trimmed with mini pom poms. 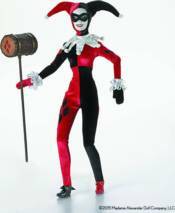 Harley Quinn carries an oversized brown 'wooden' mallet.